Very few classic United States commemorative coins were struck in order to mark an achievement in the field of engineering. The 1915-S Panama-Pacific International Exposition coins may be included within this small group, as they commemorate the world’s fair which itself celebrated the completion of the Panama Canal. 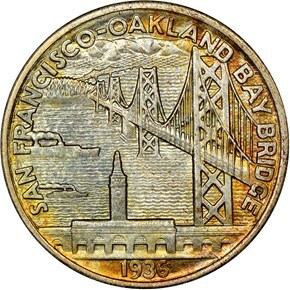 The only coin dedicated solely to recognition of an engineering triumph, however, is the 1936-S half dollar issued to mark the opening of the San Francisco-Oakland Bay Bridge in November of that year. By the 1930’s, San Francisco was a bustling city of over 600,000 residents. Unfortunately, it was geographically isolated on the tip of a long peninsula, meaning that ferries were often used to traverse San Francisco Bay. The idea for a several-mile long bridge to cross the bay was proposed as early as the 1920’s, but the tipping point came during the depression. The need for new jobs helped propel the project into fruition. Construction of the bridge commenced on July 9, 1933 and was completed during the latter months of 1936. The grand opening was held the weekend of November 12-14, with a long line of motorists and pedestrians eagerly awaiting their turn to cross. 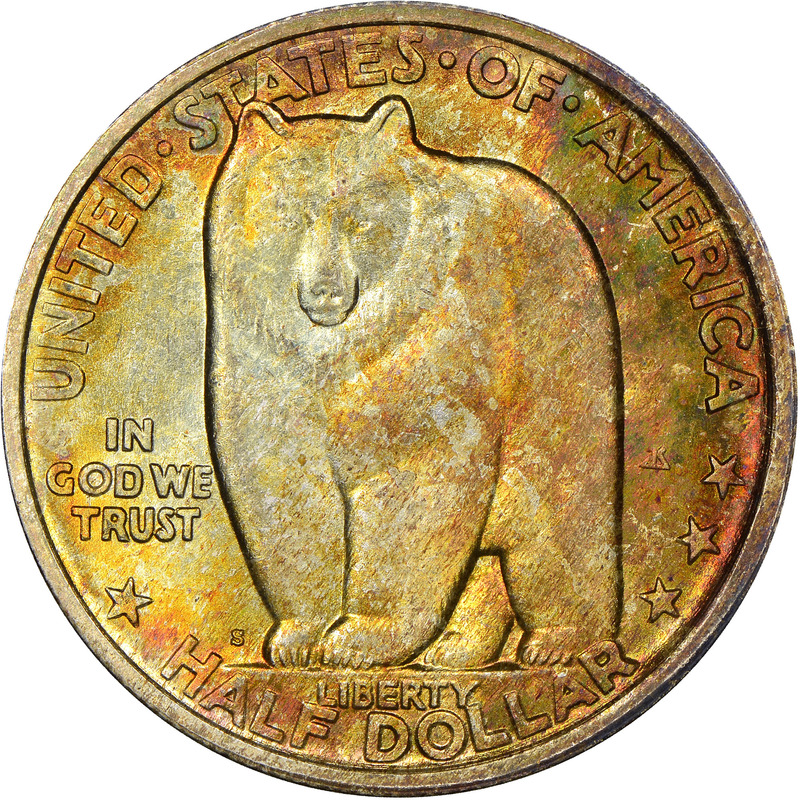 Although not ready for opening day, among the souvenirs available a week later were the United States half dollars, coined at the San Francisco Mint and bearing (literally!) a design which honored the engineering achievement. 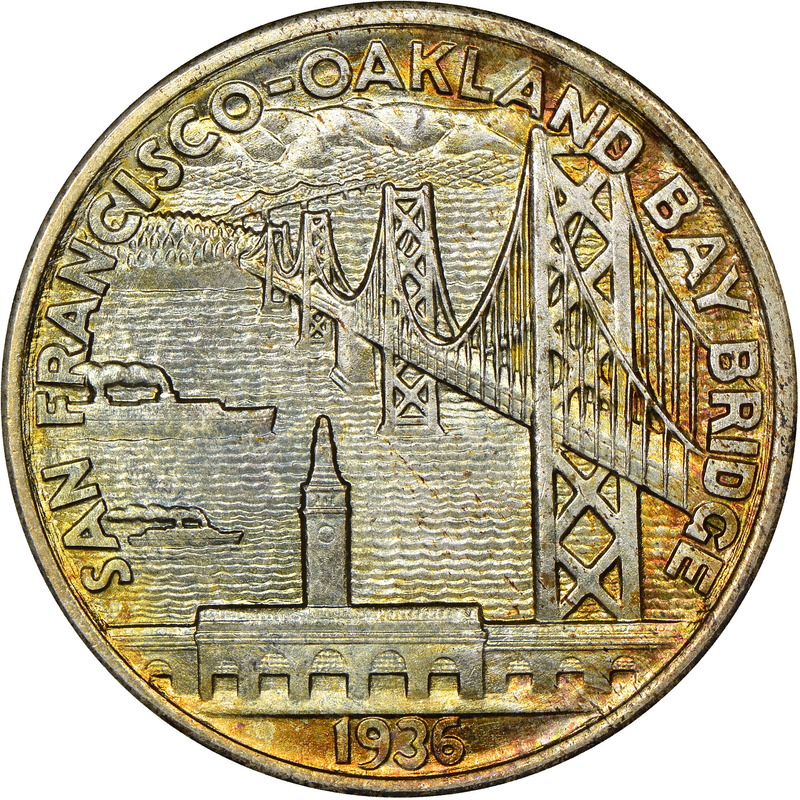 The coin’s design was executed by Jacques Schnier, a Romanian immigrant then living in Oakland. The Commission of Fine Arts reviewed his designs, and after only a few minor changes they were approved. 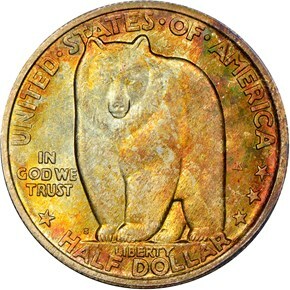 The obverse of the coin is dominated by a grizzly bear, which is a symbol of the state The reverse is a highly stylized view of the newly completed bridge as seen from San Francisco. A ferry building is seen in the foreground, which was to offer the juxtaposition of the old and new ways of transport. The coins were sold at several locations in the Bay Area at the price of $1.50 each. Perhaps the most novel of sales locations was the bridge’s toll booths themselves. Even with interest in the commemorative coin series dropping, sales were quite decent, with 71,369 of the 100,000 coins minted sold.